Port Townsend Film Festival, Seattle PBS, featured at Seattle's Wing Luke Asian Museum exhibition "Cultural Confluence: Urban People of Asian and Native American Heritage"
"ISLAND ROOTS weaves stories of Filipino pioneers and their descendants with the larger histories of U.S. immigration, agricultural labor, cross-cultural collaboration, and community formation. It's a provocative peek into a little-known account of Pacific Northwest life that is organically multi-layered and wonderfully represented." 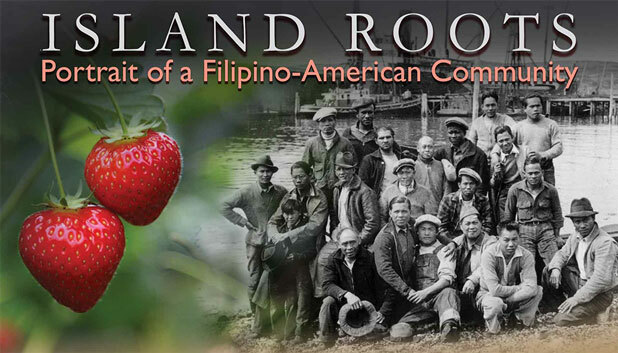 When the Filipino pioneers of the 1920’s and 30’s settled on Bainbridge Island, Washington they were hired by Japanese-American landowners to tend their renowned strawberry farms. The bombing of Pearl Harbor turned this relationship upside down when the Japanese Americans were forcibly removed from the Island and incarcerated during WWII. The Japanese American community left Bainbridge Island on March 30th, 1942, just a few months before the strawberry harvest. The Japanese American farmers needed stewards and their Filipino farmhands brought in the harvest, paid the taxes and saved the farms. The Filipino bachelors also introduced a new immigrant group, First Nation women from Canada, into the social mix. After the war, some of the bachelors traveled back to the Philippines and returned with brides. Through it all the “Bayanihan spirit” where the community comes together and works for the common good, fed this community and everyone it touched.